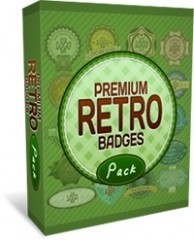 Create Your Own Badges, Logos and More With This Brand New Collection Of Premium PSD Templates! These are fully layered PSD templates. Photoshop is prefered to use them, but you can also use them with any other program that opens layered PSD files (like Photoshop Elements or Gimp). And in case you don't have a program that opens PSD files, I'm also including transparent PNG files that can be used with ANY graphics editor.